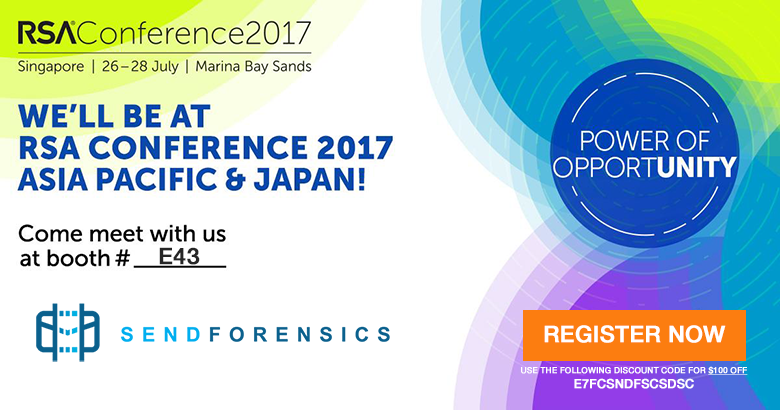 "RSA Conference 2017 Asia Pacific & Japan is the leading information security event in the region. Get exposure to innovative technologies and leadership that will help secure your organization and your future." Visit SendForensics at Booth E43! We'd love to meet you and share how our unique pre-emptive anti-phishing solution can boost security and compliance for your organisation. Access to the exhibitor floor is free, but you can also take advantage of our special exhibitor discount when you register for a full conference pass (access to keynotes, workshops etc. ): use code E7FCSNDFSCDSC for S$100 savings. Register now and save!